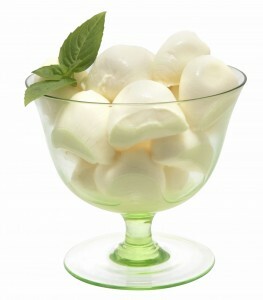 Fresh Mozzarella di Bufala is one of the greatest delicacies of the Italian cuisine. This delicate, porcelain-white, unripened cheese is produced from the milk of water buffaloes which live in the wet lowland swamps of Campania region, the countryside area around Naples. They were typically used for plowing in the watery terrains, both because the strength and the size of their hooves, which do not sink too far into the moist soils. They are also known to survive in conditions where no other animal could survive, on almost any food. 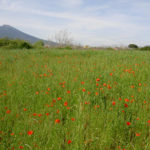 The regions known to produce Mozzarella di Bufala in Southern Italy include Caserta, Salerno provinces, Benevento, Naples, Frosinone, Latina, and Rome, with approximately 77% or 85% of the Italian buffalo farmers located in Campania. Most of the fresh mozzarella sold all over the world, even in Italy, is made from cows’ milk. That type of mozzarella has less moisture, is consequently more firm, and it is extremely mild. Mozzarella di Bufala on the other hand, is immensely flavorful, rich in butterfat and very satisfying. It usually comes formed into a round or oval ball, but its shape may vary, from braids(treccie), cherry-sized balls (ciliegine) to pearls (perlini). Mozzarella di Bufala is considered a protected trade product based on the production process, source of milk, and geographic origin. The product must come from either the geographic regions of Campania or Lazio. 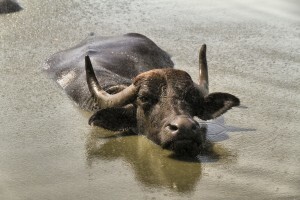 It must come exclusively from the milk of water buffaloes, and has specific temperature and time limitations from the time the milk is taken from the animals (less than 48 hours), in order to ensure freshness of this quality product. The balls of Mozzarella di Bufala remain in a whey and brine liquid the entire time, which is what keeps the cheese fresh and renders the exquisite flavor.